We´re very lucky here to be able to get hold of the freshest, free range goat and lamb. I know that most lamb is free range anyway as it needs to graze, but I guess we can never be too sure if there have been chemical sprayed on what they eat or if they are getting food supplements. When I first arrived in Spain my only experience of eating goat was in a plate of curried goat at an ethnic restaurant in London. It was alright, I suppose, but apart from a delicious sauce, the meat was rather tough and greasy. I read somewhere that more goat is consumed per person in the world than lamb, and I guess it makes sense. They are hardy creatures, can survive in very rough terrain and can climb to what we would consider inaccessible heights to reach their food. Once I had tasted good kid (or young goat) out here, I realised that taste wise, it´s very, very similar to young milk fed lamb. When you see the flocks of goats going past your house daily, you know they´re well fed and looked after. We buy direct from the goatherd who slaughters for you and then you have to prepare it for the freezer. I´m sorry if this all sounds a bit gruesome to anyone who either doesn´t eat meat or is a bit squeamish, but it´s what has to happen if you choose to eat meat. And I do, and luckily I am able to eat the freshest most organic, free range meat possible. Whew! Hope that didn´t sound like I was on my little soap box. Anyway, one of the cuts of meat you get is neck of kid -and I know that in the UK at least, you can buy neck of lamb. It used to be one of those cheap cuts, but has now become trendy. It´s cooked in the oven simply and then depending on the weather I serve with salad or vegetables and plenty of crusty bread to mop up the juices. It´s best picked up and eaten with your fingers! Rub the lamb with seasoning and roughly chop the rosemary and mix it in with the lamb. Peel and half the garlic cloves and add them in. Pour over the wine and if you have time to leave it for a couple of hours, so much the better. Put into an oven dish where it will fit quite snugly and put into a high oven for 10 minutes. Lower the heat to medium, cover with foil and cook for a further 45 minutes approximately. After about 20 minutes check the liquid – you don´t want to casserole it but you want some at the bottom of the bowl to cause a slight steam effect under the tent of foil. If necessary add more water. When it´s done (you can check by prodding with a skewer to see if the juice run clear), remove and leave it to sit for 10 minutes still under the foil. Squeeze over a little lemon juice, then serve and enjoy! PS. Sorry for blurry photos, they were taken with my old camera which was on its last legs! This sounds delicious and it’s the sort of recipe I’ll use for the neck of lamb we have in the freezer, part of a half lamb we bought direct from the farmer. I’ve only cooked shoulder of kid, which didn’t need such long cooking – kid from the local goat farm is traditional at Easter here. The goats spend their days on this hills eating wild vegetation and the kids are slaughtered in April – my soap box bit: if you don’t have kids/calves/lambs you can’t have milk and cheese and not all the young can be kept! Yes, we eat kd at Easter too. And I agree with what you say. For some (strange) reason, some people are freaked out about eating goat over lamb. Maybe I was guilty of a little fo that too myself before it became the norm for me to eat it here. Animals fed on grasses and wild herbs are just going to taste great! 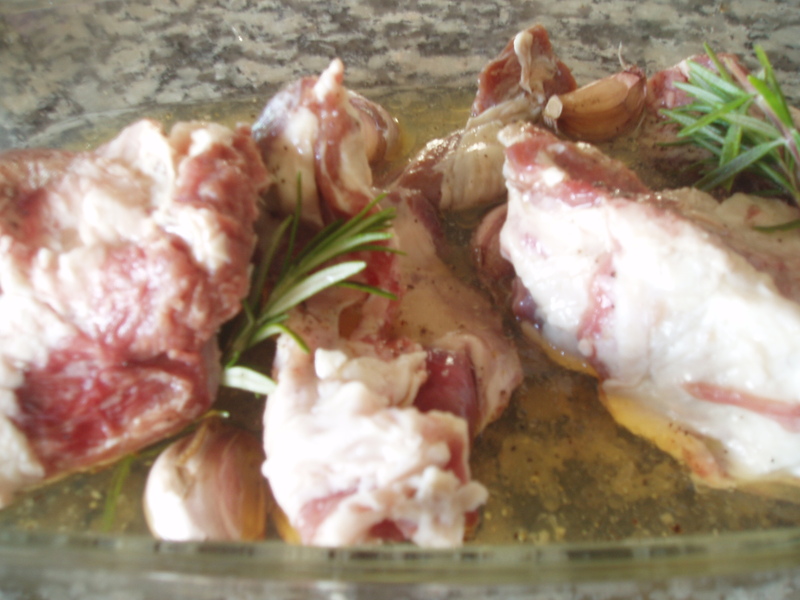 Strangely, I have never eaten goat – well not that I know of but I do love lamb which marries so well with the flavours of rosemary and garlic. Hi Mandy. I guess it´s just not available everywhere. I certainly never came across it in many London butchers, although perhaps there´s more now, especially as many farms are turning over to organic and producing goats cheese etc. And yes, lamb with rosemary and garlic is just sublime! My main experience with goat is also curry. I’d love to try it this way. Great recipe. I have a huge rosemary plant, nothing like using it with lamb. 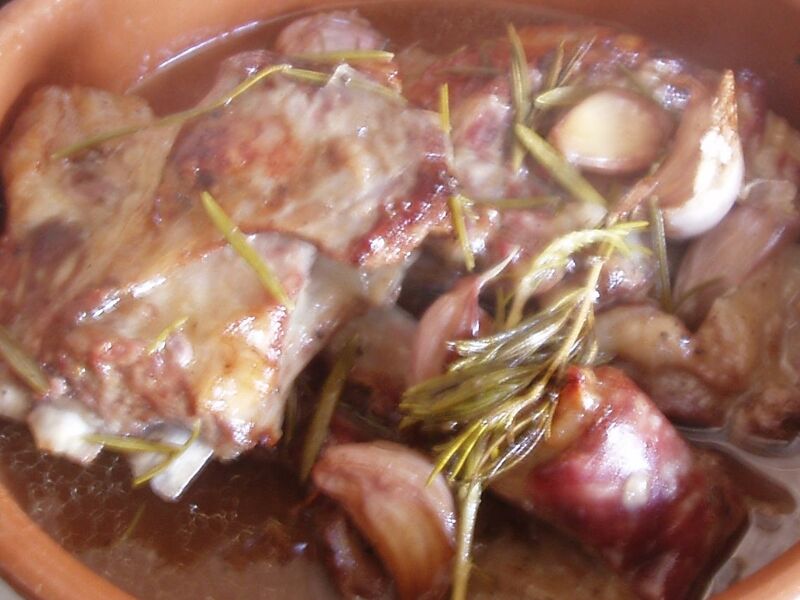 You´re right – lamb and rosemary were meant for each other! Lots of cabrito (kid) available in the markets here in Texas. I don’t find that it has its own very interesting flavor, it mostly tastes like whatever you cook it with or in. Maybe that’s just the stuff I can get here. But it is inexpensive and available, and good in a sort of “tastes like chicken” way. Now *lamb*, oh I loooooove!! lamb… pretty much anyway you (or I for that matter) fix it it makes me *very* happy! Mmmm…. hungry now (and its much too early for lunch, nuts!). Yes, cabra, cabrito here too (also chivo or choto, but I think they might be the Andaluz words). What a shame you´ve found it a bit bland. Sitck with lamb! It´s so delicious anyway (although I don´t know what it´s like in Texas, but in the UK it was a bit of a luxury due to the price). It’s a tad strange (to me) to say you are eating kid. Damn – how could I have forgotten such a critical part of the recipe. Too busy drinking wine probably! And don´t forget the garlic…..!